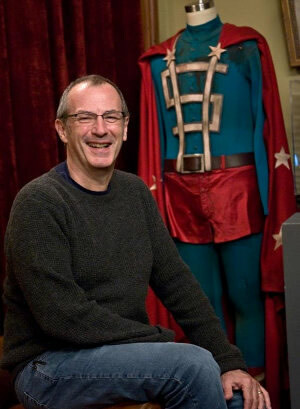 Now that the Watchmen movie has been here and gone, and with the triple-dip that is the ultimate edition DVD upon us, I thought it would be nice to chat with Watchmen co-creator, and friend of WatchmenComicMovie.com, Mr. Dave Gibbons about the whole ball of wax. Last month, the illustrative illustrator agreed to a phone interview where I could get his final thoughts on the movie adaptation of his classic work, and prod him a bit about some of the other projects he has his hands in lately. So the Watchmen film sort of got mixed reviews, which didn't really surprise me. Some people, like Roger Ebert, raved about it but many other critics and bloggers really sort of bashed it. Subsequently the box office dropped harshly after the first weekend. Do you have any insight or ideas on why that might have happened? Dave Gibbons: Well, my impression is that actually, the movie has done very well. There's a famous quote about the movie being unfilmable. Larry Gordon's riposte to that was “It's not unfilmable, it's just unfinanceable.” You're looking at a long movie — a movie that's over two and a half hours — you're looking at an R rating, no characters that anybody's heard of before, no big name actors in it. It was always going to be kind of a hard sell. And I think the fact that the Dark Knight movie was out shortly before it and did absolutely amazing business kind of made Watchmen look worse by comparison. I think that it did very well and I think that the DVD is going to do even better in DVD terms than the movie did in movie terms. I think it's going to be one of those absolute "must have" DVDs or Blu-Rays and certainly it was made with a clear eye to eventually being released in that format. I think that the number of supporting features and additional interest that there are in that version of it will guarantee its success there. I would much rather it was a movie which got mixed reviews than a movie that got bland or indifferent reviews. My experience is that some people who were very familiar with the book loved it, some who were very familiar with the book hated it and the same for people who didn't know anything about the book. So that's my take. I'd much rather have a movie that people are talking about rather than one that's just kind of bland and one that people are indifferent to. And it seems to me like there are really only two kinds of Watchmen movies we could've gotten. We could've gotten one that catered to big Hollywood, was changed around a bit, had more fights and explosions and that would've satisfied some audience members, but then it would've really disappointed fans. It's sort of "damned if you do, damned if you don't" and I'm certainly glad we glad we got a version that was faithful to the graphic novel as opposed to not. DG: Well, I think Zack Snyder was always very aware that he was damned if he did and damned if he didn't and I think he steered a very difficult course. But I think that the crucial thing for the movie was the fact that his previous success with 300 meant that the studio was prepared to give him pretty much his own say on it. I think the worst of all possible worlds would've been a “committee” version of Watchmen, which would've again been rather safe and innocuous and wouldn't have pleased anybody. I think also that there was a certain amount of disappointment amongst moviegoers that it wasn't more of an action movie. That's certainly one of the reactions I got, that people thought it was going to be much more like X-Men. But you're not going to please all the people. I think Zack just had to please himself as someone who really cared about the material and was a huge fan of the material. And as far as I'm concerned, it very much pleases me. I think that's about all I can say on that. Absolutely. Every time I brought someone to a screening, I'd cringe at the end, worrying that they'd tell me that they hated it. And everybody ended up liking it — every non-fan and fan that I've brought. I find that if somebody didn't like the film, they're seemed like the type of person that wouldn't have liked the graphic novel either if they had read it. DG: Well, it's difficult for me because obviously, I couldn't be more involved with the graphic novel of Watchmen and I'm very involved with the movie as well. But I am a fan of comics and I try to stand back, thinking “If I was just a fan, and wasn't professionally involved, what would I think?” And I have to tell you that it seems like fanboy Christmas to me. I've used that expression before, but this movie was made by people who were a hundred percent dedicated to doing the best possible version and be as faithful to the book as they could. They've also done supporting material which fills in the background and gives all this extra detail and texture for fans. I think the kind of merchandising — the figures, the models, things like that that have come out — are really, really gorgeous. I know that one of the things of being a fan is that the minute the world at large knows about your passion, it is no longer your passion and there was always going to be an element of that. But I really have to stand back from it and say that if I wasn't Dave Gibbons, I would be thrilled about this anyway. DG: I agree. The first time I saw it, it was kind of a rough cut private showing in July 2008. At that point was like every other fan when they first saw the movie. I was just going [in a really fast, excited voice] “Oh wow, it's the Comedian! Oh wow, it's the Owlship! Oh look, it's that scene where… Oh my god, he actually says that line!” and I was looking at it that way. Of course, I'd felt very positive about this from the beginning and I have publicly been very positive. I’ll admit I did have moments of doubt “Oh my god, am I just being flattered? Am I going to come away from this with egg on my face?” I haven't been paid to say nice things, I've said nice things because that genuinely has been my feeling. And I was so pleased when I did see the movie to think “Yup, my gut feeling was right.” Thank God for that. I'm sure it didn't help when we ran an article titled "Gibbons Gushes" a while back. But, to be honest, I think when I wrote that I was projecting a bit because I really wanted to present an unbiased point of view and write an article asking "How much of this can we really trust?" many of us fans are excited for this film, but are we going to love everything that comes out because we're excited? DG: Sure. And anybody who knows me — even as much as you know me — knows that I'm an enthusiast. If I've got something to say, I'm going to say it. I did feel very, very positive about the whole thing from beginning to end. I would have to say that just as the graphic novel is not perfect, the movie isn't perfect. Perfect things don't really exist in this world. I think that the positive and wonderful things about the movie so far overshadow any slight misgivings I might have that they aren't worth mentioning. DG: Oh, wow. [long pause] That's just the kind of question I should've expected and had a ready answer to. I must admit, I can't off the cuff think of anything that is missing. I mean, I have to say that Alan's scripts are so wonderful that it's a shame to lose any words that he's written, but I think you have to stay realistic. Even in the ultimate cut, there are going to be lines of dialogue and pictures that aren't going to be there. But I think so much of my favorite stuff and the essential stuff is there that I must say — being put on the spot — there's nothing that immediately comes to mind. From the fan's point of view, it seems like the one scene they really wish would have made it in is the scene where Rorschach confronts his landlady. DG: Yes. That does add a lot to Rorschach, the fact that he sees this kid who could be him. I think it's a lovely moment and I would love for that to be in there as well. But I suppose in a way, it's almost like a descending list of moments from what's absolutely essential and crucial to what's actually relatively unimportant or marginal. And again, as I just said, everything that Alan writes as far as I'm concerned is gold. But I think that that scene was probably down towards the bottom of it. In strict narrative terms, it wasn't necessary. The scene with Rorschach that I really love that is there — it was always one of my favorite scenes from the graphic novel — is where he shakes hands with Dan and he prolongs the handshake a little bit too long. That was a very minor thing that really said so much about Rorschach. So I think there are those kind of moments in there which do give that extra dimension to Rorschach. Again, I think it would've had to have been not only that lovely tableau with him and his landlady and his kid, but it would've had to have been the whole thing where they go back to the place and it would've added two or three minutes to the whole thing which, crowded as it was, was obviously two or three minutes too much. I mean, Really? He had a spare of everything? How convenient. DG: I know. I think that was one of those moments where Alan — being a very methodical and logical plotter — thought “Ah! How are we going to give him his coat and everything back?” So I think that he had to write that scene in there. But typically for Alan, he made something more of it than just a mechanical scene of going to retrieve something essential, which was why that little interplay with the landlady and her kid exists anyway. And I must say that when I saw the rough cut of the movie, there was a plot hole there for me as to how Rorschach ended up back with his coat and his journal and everything like that, and I think that little scene they put in there where he actually goes into the psychiatrist's office to find Malcolm Long cowering in fear and puts the mask on and says “What do you see?” I think is a wonderful, wonderful scene in the movie. I think probably if I was going to trade the two scenes, I might even go for the version of the plot hole solution in the movie! So, all the jet-setting that you've been doing, all the promotion around the globe for Watchmen, is that all done now or will you have to make the rounds again to promote the ultimate edition? DG: Well, believe it or not, I'll actually be in New York this weekend! I'll be there for not very long, flying in on Friday afternoon, flying out first thing Saturday morning. Paramount International have been running a competition in all their worldwide territories in connection with the DVD and Blu-Ray, and the prize in each area was to get to go to NYC and meet me and the ultimate prize winner gets drawn into a group shot of all the Watchmen characters by me. So I'm going to be lurking in a hotel room in New York on Saturday afternoon and these people from around the globe will be ushered into my presence and I'm gonna perform artistic miracles for them. That's the plan, anyway. Nice! And for the ultimate ediition DVD will you have to make the rounds again for that? DG: I don't know about that yet. Certainly, nobody's asked me about that. I guess it’s still three months away, but I've seen the PR through so far and I'll certainly see it through to the end. I have had a really good year or so of it. Before it all began, I was having dinner with Mike Mignola, who's obviously had some success with Hellboy. I said, “Mike, you've been through this Hollywood thing, I'm just about to embark on it. Can you mark my card for me?” He said at the end of the day, there probably won't be that much money left, which is even more true in the case of Watchmen than it is with Hellboy! He said, “Along the way, you'll have some great travels, you'll stay in some nice hotels, meet some really interesting people, and just enjoy it.” And really, that's what I've done. I'm having a great time and my family's been included as well. I managed to get… well, I can't even tell you how many, but I got loads of my family into the premiere in the UK, I was over to go to the Hollywood premiere with my wife and my stepdaughters and my son and his fiancee, and they was another screening in London with another fifty of my friends, so it's been great. I've been able to enjoy it, my family's been able to enjoy it as well and I've been very well treated. I've had a really good time, so if they want me to do more appearances, I'm game. You should know this because I know you go to my website and that's the lead story right now. So will you be going to the Scream Awards? DG: I can't remember. Though obviously, I read every word on the site, I can't remember when it is and no one's said anything to me about it. And I think really, in a sense, it falls to the filmmakers. I get the idea it's the award for what they've done. But if there's any free plane tickets and nice hotels there, sure! In the category for “Best Superhero,” Watchmen nabbed three out of the six nominations and of course Jackie Earle Haley's Rorschach is one of the three Watchmen heroes nominated; I certainly hope he pulls that one out. DG: Sure. I think everybody did absolutely sterling work on the movie, but I have to say that Jackie absolutely nailed Rorschach and I think he made him such a memorable movie character that it would be a crime if he didn't get some sort of recognition for it. 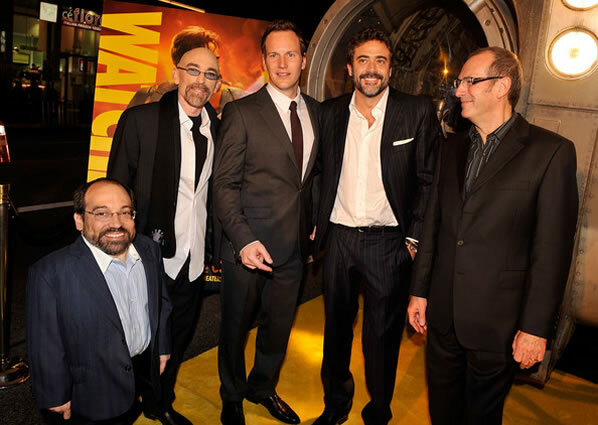 Watchmen was also nominated for "Best Holy Sh*t Moment" for the destruction of Manhattan. DG: Really? So not everyone was weeping over the squid. And, in the category, “Most Memorable Mutilation”the rotary saw cutting off the prisoner's arms edged out the cleaver in the head for a nomination. DG: Well, it's so hard to choose between the two, isn't it? Maybe the remains of the gangster dripping off the speakeasy ceiling. You know, it's difficult isn't it? Definately. Every other film going up against Watchmen in that category is a horror film. DG: Well, that shows you what an exceptional movie it is, that it can cover all those bases!